In the construction of a truth narrative, we struggle with dualism and trust. For any student of history, politics, science, or life, we come to a hard problem of human cognition – dualism. As I critiqued in this blog about the binary nature of language, we are subject to errors in judgement when we parse the world into true/false rather than many shades of grey and incomplete. As I sit in lectures at the 2018 RAADfest (revolution against aging and death), I realize how dependent we are upon the SOURCING HEURISTIC as I discussed in this blog. That logical fallacy is that we base out credence upon the source. In the blog, Brian Williams was supposed to be reputable, so we believe him or her. But think about the most trusted people in our lives…our parents. Did they really merit that trust when they foisted the Santa Claus conspiracy upon us? I would consider the best barometer of honesty is someone who is first able to admit how their own dogma is incomplete as I do in this post. That doesn’t mean wrong; it just means that someone like myself, who maintains that telomere erosion in stem cells causes most disease is also able to critique the use of telomere measurements as a foolproof method of understanding and measuring all of aging. So the point of the post is that we can’t believe experts but must use their information to assemble a larger picture. We can all be right, wrong, partially right, and intentionally or unintentionally misleading. Don’t follow leaders. Use your intuition to seek truth. If you want to learn how your own body and consciousness work to heal you, read my book, The Telomere Miracle. 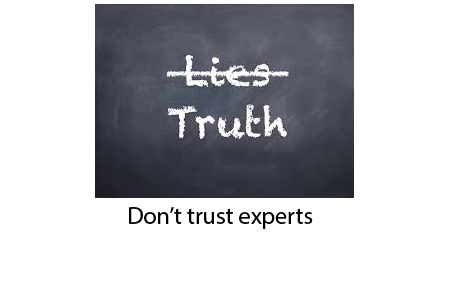 It will debunk and explain many aspects of health advice that are otherwise quite confusing and contradictory. Excellent post! However, I suggest that intuition is not the best guide to seeking the truth for one of the products of intuition is heuristics and biases that include the sourcing heuristic. Today, in virtually every case, the builder of a model uses heuristics and biases in selection of the predictive inferences that will be made by this model. Selection of the inferences by optimization is made possible by the fact that its entropy is the unique measure of an inference in the “probabilistic logic.” This is the logic that is formed from the classical logic by replacement of the rule that every proposition has a truth value by the rule that every proposition has a probability of being true. Beginning in 1963, a search was conducted for methods by which heuristics and biases could be replaced by optimization. Playing the lead role was a theoretical physicist, engineer and lawyer by the name of Ronald E. Christensen. By 1980, Christensen had successfully completed this work and documented it in the multi-volume “Entropy minimax sourcebook.” In completing this work, Christensen had solved the ancient, previously solved “problem of induction.” The problem was of how in a logically defensible manner to select the inferences that were made by a model from the larger set of possibilities. Thirty eight years later, the vast majority of model builders continue to select the inferences that will be made by their models by using heuristics and biases.